The global mine supply from the top silver producing countries may decline more than the industry forecasts. The leading consultancies reported that global silver production would increase moderately by 1-2% in 2018. However, the data from several countries and large mining companies suggest that overall world silver production may decline by 2-3+%. For example, the top two leading silver producing countries, Mexico and Peru have reported declines in 2018, according to their official data. Mexico's silver production, fell 2.5% from Jan-Oct 2018 compared to the same period last year while Peru's mine supply fell more than 5% (Jan-Nov). Furthermore, KGHM, the large copper by-product silver mining company in Poland reported an 8.7% decline in silver production in the first three-quarters of 2018. Poland was the seventh largest silver producing country in 2017 and KGHM was the main supplier. Russia's leading silver producer, Polymetal International, also recorded a 4% reduction in silver mine supply Q1-Q3 2018 versus the same period last year. However, the biggest losers were Canada, down 12%, and the United States reporting a stunning 16% drop in domestic silver production. Now according to my analysis of eight countries I researched, the only one that reported an increase was Australia at 8%. 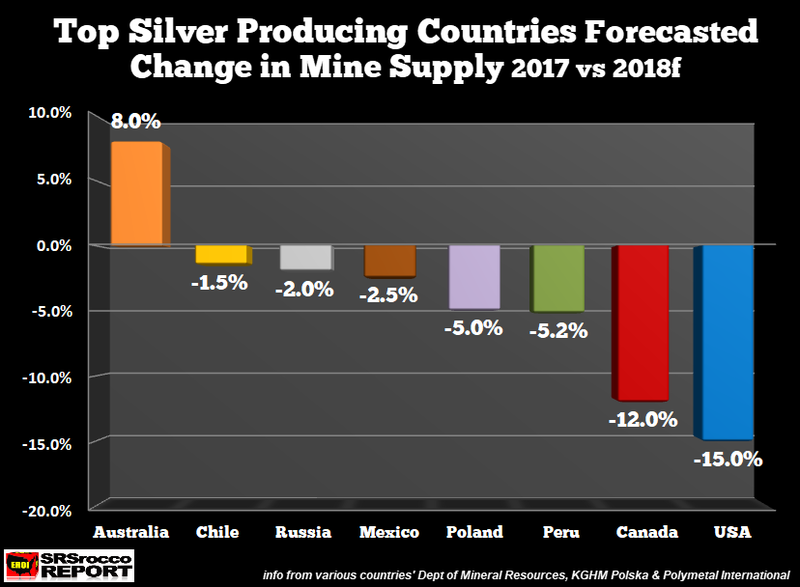 Unfortunately, it is difficult to get data for China, the second largest silver producing country in the world, but I doubt its mine supply has increased more than the declines shown in this chart. According to the World Silver Interim Report, they forecast global silver production to increase by less than 1% in 2018 due to gains in Oceania, Asia, and Africa. They did note that silver production in North American would decline by 5.4 million oz (Moz). But, that 5.4 Moz decline must account for just the United States and Canada. What about Mexico and Peru? According to my analysis, I believe Mexico and Peru's silver production is estimated to fall by more than 12 Moz in 2018. Moreover, if we consider the total shutdown of the second largest primary silver mine in the world, Tahoe's Escobal Mine in Guatemala, we can slash another 10 Moz of silver production. So, even if there are some silver production gains in China or Africa, stated by the GFMS in the World Silver Survey's Interim Report (released in November)... I doubt they are going to offset all of these declines. The countries including in the data above were Mexico, Peru, Russia, Chile, Poland, Australia, U.S.A, and Canada. The data was collected from Mexico's INEGI, Peru's Ministry of Energy & Mines, Russia's Polymetal International, Chile's COCHILCO, Poland's KGHM Polska Miedz, Australia's Resources & Energy Quarterly, the United States USGS and Canada's Dept of Natural Resources. 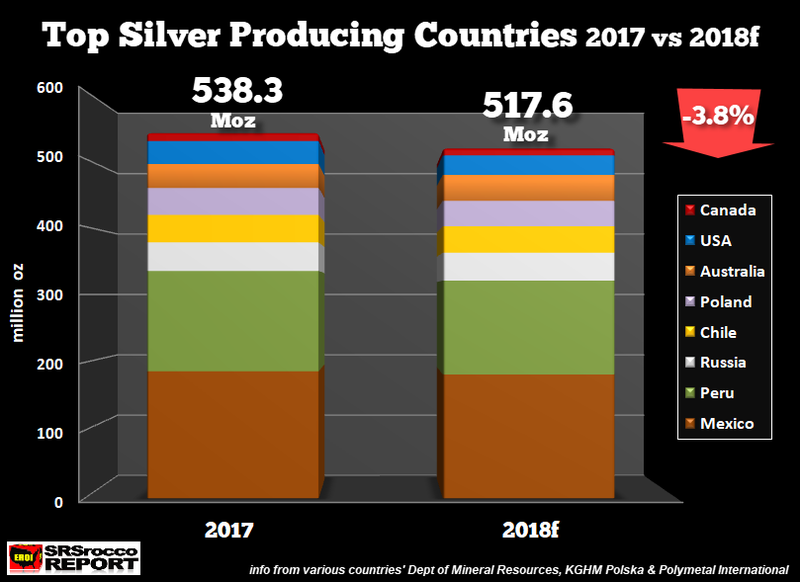 The World Silver Survey forecasts an increase of global silver production in 2018 at 865 Moz, up from the 852 Moz in 2017. However, I believe overall production will be down 2-3%. Thus total world silver mine supply may be between 827-835 Moz, down 17-25 Moz. Of course, I don't have the data for China and many of the smaller countries, but I believe the leading metal consultancies have overestimated global mine supply. Lastly, we must remember that nearly 60% of silver mine supply is a by-product of copper, zinc, and lead production. Base metal production will likely fall considerably when the world begins to collapse due to the unraveling of the highly leveraged debt-based economy... an economy that will no longer have a growing energy supply to service the massive amount of debt propping up the financial system. Thus, falling base metal production will impact world silver mine supply more than gold. Which is precisely why I believe silver will outperform gold in the future.